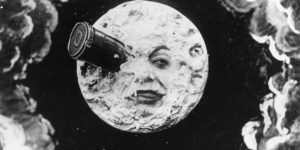 I’m excited to be presenting my score to Georges Méliès’ Le Voyage Dans La Lune this Friday at The Colburn School’s Thayer Hall in Los Angeles. The score will be performed as part of a program by Colburn’s Contemporary Ensemble under the direction of Ted Atkatz. Showtime is at 8pm. We debuted this piece earlier in the year as a part of the St Barts Music Festival, and you can watch the movie synced with that performance here.